While it may be true that baseball is the great American pastime, it is quite arguable that football has crept up on that status rather quickly. From the middle of December to the end of January or beginning of February, the playoffs and the Super Bowl seem to be one of the more talked about events. With anticipation building throughout the month of January, it's no wonder that Super Bowl Sunday is one of the biggest party days of the entire year. No matter what states' teams actually end up playing, the Super Bowl is a celebration that spreads far and wide across the entire nation, leaving no city untouched. The scariest party about this one simple day is that there are some national holidays that get less attention than Super Bowl Sunday. The typical Super Bowl celebration includes no shortage of two things – Food and Alcohol. With the parties I grew up with, the staple foods included the coveted "Big Sandwich" (always half American, half Italian) with side salads, a slew of chips and dips, coolers filled with beer and soda, and, on several occasions, a homemade chili. While there is no set menu for every Super Bowl party, you can guarantee that at least one of those food items will make an appearance – because really, nothing says an American sports party like a Big Sandwich. If you decide to spend the game day outside of the comfort of a home, you'll find that a lot of sports bars will have catered food specials and one-time buffets set up simply in celebration of a football game. Buffalo wings, mini heroes, and spreads of macaroni and potato salads at any party could easily make you feel like you never left your house. If you do decide to travel outdoors for the Super Bowl, you should be wary of when and where you go. Locations like sports bars can fill up quick, and there is nothing fun about an overcrowded venue filled with rowdy (and potentially drunk) football fans. If you find yourself in a city like Las Vegas during this big event, you'd be hard pressed to not find some sort of celebration worthy of a visit. Though Nevada is void of any home team, the Super Bowl is not a lost event in Sin City. 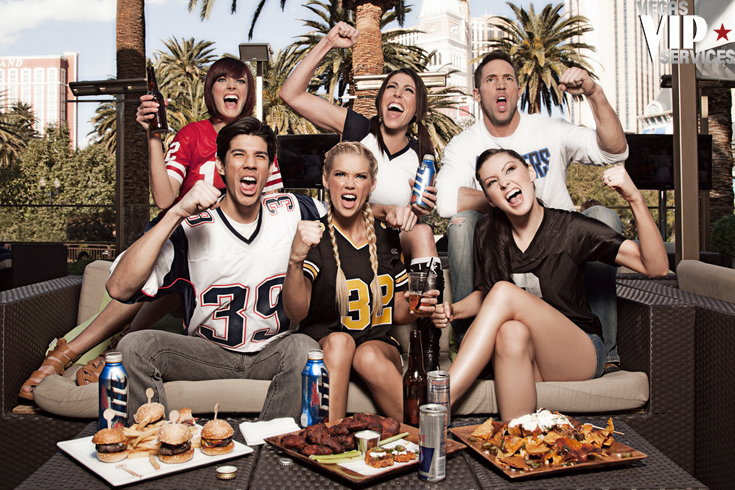 In fact, chances are some of the best Super Bowl parties happen along the stretch of Las Vegas Boulevard. Even the classy nightclubs jump onto the Super Bowl bandwagon and host some form of party with, typically, B-list celebrities at the helm. Amongst the innumerable amount of clubs, venues, and bars within the city, a few stand out as being your go to spots for Super Bowl Sunday. At the base of the Palazzo Hotel and Casino stands Lagasse's Stadium, a sports book owned by famed chef Emeril Lagasse. You can't go wrong with the menu, which is inspired by Lagasse's usual Louisiana flair. Barbeque delicacies and Creole classics grace this menu and ensure that your chances of going through the game hungry are slim to none. Giving Lagasse's Stadium a run for its money is the New York, New York's Sporting House Bar & Grill. Decorated with 130 HD TVs and a row of plush leather recliners, the Sporting House Bar & Grill creates the perfect game time atmosphere and keeps all football fanatics close to a fully stocked bar. The comfortable seating ensures a more "homey" atmosphere that'll keep guests comfortable and drinking. If you're along the strip on Super Bowl Sunday, you can always partake in the festivities at the Hard Rock Race & Sports Book or Blondies Las Vegas at Planet Hollywood. For those that take a liking to the cheerleaders, Sin City has the perfect solution for your little fetish by bringing the collective sexiness of the televised cheer team a few mere feet in front of your face. Even the local strip clubs get into the football spirit with special events and celebrity guest dancers, creating the perfect atmosphere for the best of a Super Bowl after party. Is there ever a better mix than gorgeous women and adrenaline inducing sports? Outside of food, Super Bowl parties are also known for an activity that the tourists and locals of Las Vegas are all too familiar with. On Super Bowl Sunday, betting and gambling runs rampant across the country as people spend their hard earned money on chances and guesses. Sport books, local bars, and even groups of friends and fellow employees set up various betting pools to make the game even more interesting. Though the main pool typically focuses solely on which team will end up winning the game, there is a great possibility of many different smaller pools that tack on to the main pool. These can include, but are certainly not limited to, the numbers the final scores will end with, how many touchdowns will be made, the kickoff return yardage, the outcome of the coin toss, and who will be named the MVP. There are so many variables within a football game that, really, the list of bets that can be made can be quite extensive. If you are going to partake in a little friendly betting, though, be sure to avoid over extending yourself – people are less than happy when you can't follow through with the dollar amount. At its core, the Super Bowl is more than just a football game. It's a pastime that brings people together much like the Christmas season does. No matter what your flavor is for that day - be it for the long awaited Super Bowl commercials, the Super Bowl Half-Time Show, or just enjoy the game itself – you'll surely find yourself a good time no matter where you are.